Sixty-four metric tonnes of “Best Choice” spot prawns were commercially harvested from Howe Sound in 2015. In 2011 prawn catch by trap peaked for the decade with a catch of 118 metric tonnes (Figure 1). The pattern of annual catch is similar B.C. coast wide, with a high catch in 2011 followed by a declining trend to a fifteen-year-low in 2014 and an increase in 2015. (Data were not yet available for the 2016 season, as of the writing of this article.) Spot prawns caught by trap in B.C. are ranked a “Best Choice” by the Seafood Watch program, and are recommended by the Vancouver Aquarium’s Ocean Wise program. Figure 1. 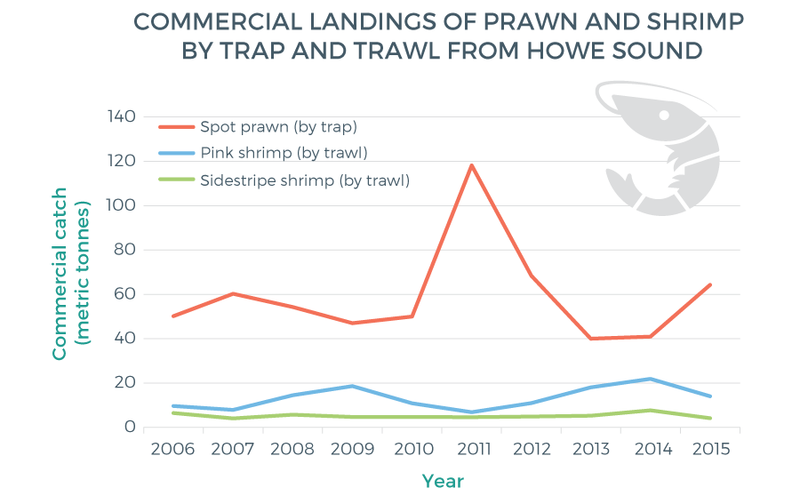 Commercial landings of prawn and shrimp by trap and trawl from Howe Sound. 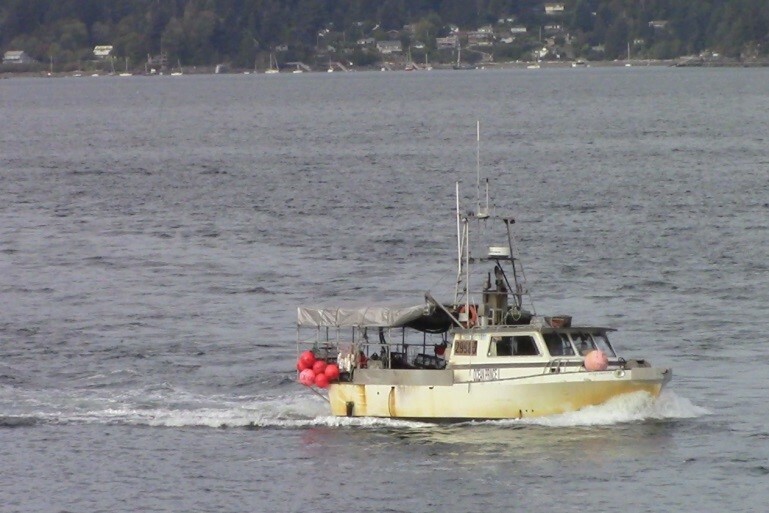 A fishery for shrimp and prawn by bottom trawl gear also operates in Howe Sound, harvesting between 11 and 30 metric tonnes of pink and sidestripe shrimp each year (Figure 1). (For 2016, the pre-season pink shrimp biomass forecast for areas off the West Coast of Vancouver Island was only about 20 percent of estimates for the 2015 season. Further, 2016 in-season survey results suggested even lower biomass and catch ceilings were reduced accordingly.) These shrimp are also recommended by Ocean Wise, but ranked slightly lower, as “Good Alternatives,” by the Seafood Watch program because of the additional impact of bottom trawl gear. 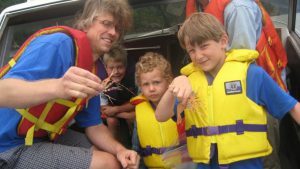 Recreational shellfish trapping is popular in Howe Sound. In fact, the area including Howe Sound, Indian Arm, and Burrard Inlet (i.e., Pacific Fishery Management Area 28) sees the highest recreational effort for shellfish trapping by boat on the B.C. coast. July, August, and September see the highest effort. The commercial prawn and shrimp by trap fishery is one of the most economically valuable fisheries in the Pacific Region. Coast wide value in 2014 was $32.6 million, which made it the fourth most valuable commercial fishery after halibut, geoduck, and crab fisheries, of which only the crab fishery was active recently in Howe Sound. The catch, and presumably value, of the commercial prawn trap fishery in Howe Sound hovers at between two percent and four percent of the B.C. coast-wide total. The relative importance of the recreational fishery is even greater. Two thirds of B.C. prawn and shrimp sport fishing effort in 2010 was focused on the Strait of Georgia. As noted above, Area 28, which includes Howe Sound, has the highest recreational effort in B.C. for shellfish trapping by boat. Recreational fishing activity not only provides food for personal use, it connects people to the natural world. Roughly 75 percent of recreational fishing licenses in B.C. are held by B.C. residents. Spot prawns have become the darling of a local sustainable seafood movement after they became a recommended sustainable seafood choice by the Vancouver Aquarium’s Ocean Wise program in 2014, following an assessment done by the Monterey Bay Aquarium’s (MBA) Seafood Watch program. Sustainability rankings mean that the fisheries are generally well managed and sustainable, though with potential for improvement. Concerns about potential adverse effects of trap and trawl gear types on sensitive bottom habitat, especially sponge reefs and bioherms have been repeatedly raised in Howe Sound and elsewhere. This applies to recreational prawn traps as well. Additional concerns about potential impacts of commercial and recreational fishing gear include bycatch and entanglement. Entanglement of marine mammals, sea turtles and basking sharks is possible, but has not been noted as an issue in Howe Sound. Juvenile rockfish are sometimes unwanted catch, or bycatch, in prawn trap gear and even if released at the surface are presumed not to survive due to their unique physiology. Quillback rockfish, a species quite common in Howe Sound and listed as threatened by the Committee on the Status of Endangered Wildlife in Canada (COSEWIC), are the most frequently encountered in the prawn fishery. However, research from 2002 to 2008 showed that estimated rockfish bycatch is lower in Howe Sound than many other Fishery Management Areas. Bycatch in the trawl fishery can include eulachon, an energy rich forage fish with significant First Nations cultural importance, and listed as endangered by COSEWIC. Eulachon are being considered for listing as Endangered under the Species at Risk Act (SARA) and the viability of eulachon in the Squamish river watershed is currently being studied. Data quantifying recreational catch and effort has been lacking in the past. As of April 2013, Tidal Waters Sport Fishing license holders are required to provide information on their recreational fishing activity when requested. Survey participants are randomly selected and are asked to participate in the Internet Recreational Effort and Catch (iREC) Survey. A DFO report on recreational buoy surveys (daytime counts of buoys connected to traps) that have been conducted coast-wide to provide baseline information on relative levels of prawn fishing effort is in preparation. DFO conducted such a survey in Howe Sound in 2015. Keep your traps away from sensitive areas including sponge reefs, bioherms, and RCAs. Release live catch (i.e. bycatch) in waters where caught. Use ‘rot cords’ (a biodegradable escape mechanism) on your traps to allow bycatch to escape in the event traps are lost. Make sure your buoys are clearly identified with your name. Report any gear theft and the theft of catch from traps to the police. Report accurate fishing activity and catch to DFO when requested to do so. Release prawns and shrimp that are carrying eggs under their tails (known as berried prawn and shrimp), as soon as possible and at the fishing location. Expand sponge reef closures to include all sponge reefs and bioherms identified in Howe Sound, in accordance with the Sensitive Benthic Areas Policy. Allocate more resources to enforcement of fishing regulations including protected area closures.